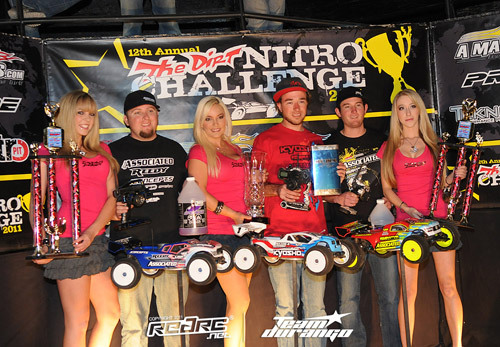 The Dirt Nitro Challenge is always one of the biggest events of the year and 2011 was no exception. 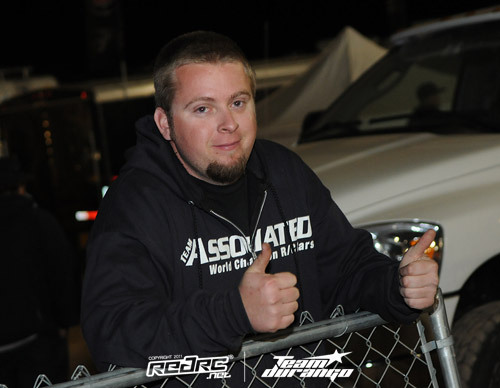 The highly technical, Joey Christensen built track, and race surface always provides thrilling racing and while practice is where typically drivers get the feel for things, the main events are where the best drivers put their stamp on the event. Saturday was main event day for all truck racing and Jeremy Kortz sat out front TQ’ing the popular Short Course 4×4 class. Jeremy was decked out with JConcepts gear all weekend utilizing the popular Raptor body, Double Dees tires and Rulux wheels on his Hobao Hyper 10SC. When the main event sounded Jeremy shot out in the lead and led for the first 2 laps. Casey Peck who qualified in the 4th position made his way into 2nd and then after a small mistake by Kortz, Peck took the lead. 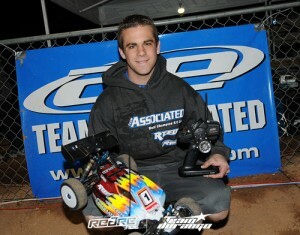 Casey was on fire during the mains and took the win followed by Jeremy Kortz in 2nd and Kevin Gahan in 3rd. The finally on Saturday was the 1/8th truck A-main. TQ Jared Tebo took the lead while battling with Ty Tessman and Ryan Maifield and each driver took their turn leading the main with Maifield on a slightly shorter pit strategy. The strategy meant he needed to make-up 6-8 seconds during the course of the race to be in contention during the finish. A man on a mission, Maifield running ultra quick 43 second laps put the hammer down on this JConcepts equipped RC8T-CE and pulled right up on the back of Jared Tebo during the last several laps making up the distance needed; he made a race out of it. Grabbing a grip-full of throttle and using a unique driving line, Maifield made a brilliant and daring pass on the huge “hip” jump on the back right corner taking the lead. While the crowd was going crazy for the Arizona native, Tebo made a brilliant move of his own tripling the straight jump section landing slightly inside of Maifield as they both attempted to make the next turn. Maifield got the worse end of the contact which gave Tebo a large lead and in the process the extra (last) lap while Maifield was called finished at the line taking 2nd place. Rounding out the top 3 was Ryan Cavalieri, a past winner who recovered from a poor start to finish the main on the podium. Maifield and the JConcepts team nailed the tire selection electing to go for the Sevens in blue compound for the 45 minute, semi-dry surface. Punisher RC8T-CE body and Illuzion HD rear wing topped off his dynamite 1/8th truck combination. 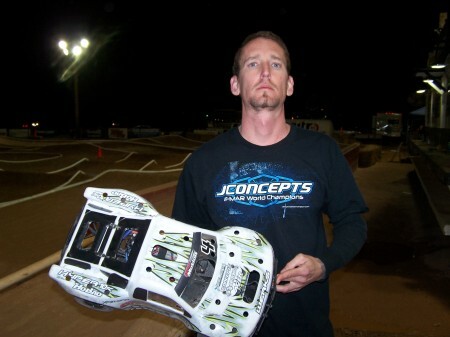 Steven Hartson known for his abilities in 1/10th scale put the field on notice that he came to win in the 1/8th E-buggy class. Racing against some of the best E-buggy drivers in the country such as Adam Drake, Travis Amezcua, Jeremy Kortz, Cody King, Taylor Peterson and Josh Wheeler, Steven took his knocks early in the main falling to the 3rd position. By lap 3 Steven had already moved into contention and with a quick 46.9 lap time took the lead over Taylor Peterson. The lead grew to 5 seconds and entering the last-lap Steven was in cruise control. Dropping the hammer on the last lap Steven recorded the single fastest lap-time in the main a 45.665 and with it, his first major 1/8th off-road victory of his young career. Steven’s RC8B-E was equipped with JConcepts throughout, the Punisher body, Hybrids in blue compound combined with the Illuzion HD rear wing Punished the competition all weekend. The entire Dirt crew went out of their way for another outstanding event. A huge thank you to the Dirt crew, the team at the Nitro Pit and Kenny Brosh on another successful Nitro Challenge. See you next year!